This morning, while touring around our growing farm in search of photo opportunities, I was delighted to find some ripe fruit on our early-season apple varieties. After picking and tasting a few of the larger apples from one of our 15 gallon trees, I was bitterly reminded that fruit size isn’t the best way to judge which apples are ripe. Apples won’t continue to ripen (or grow) after they’ve been picked from the tree, but ripe apples can get sweeter as starches are broken down into sugars during storage. Harvesting your apples at just the right time will ensure a tasty crop that can be effectively stored for later use. With some apples already ripening on the trees, and much of the harvest season still ahead of us, I thought it might be a good time to share some tips on how to tell when your apples are prime for picking. When trying to determine whether your apples are ready to pick, the most important considerations are what variety of apple tree you have, and how long it has been since the tree flowered. 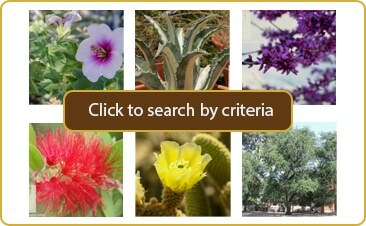 Each variety flowers and matures at different times, some much earlier than others. 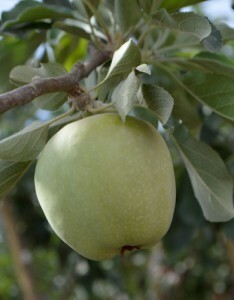 ‘Anna’ and ‘Dorsett Golden’ are two of the most popular apple varieties for Arizona with early flowering and ripening times, while ‘Pink Lady’ is a late-season variety that may not ripen until October. This publication by the University of Arizona’s Cooperative Extension has some detailed information about the different varieties of apples we grow here and their harvest times. Some trees will begin to drop healthy apples when they’re ripe, so if you start to see some good-looking apples on the ground around your tree, it may be time to start harvesting. Most apple varieties are easily plucked from the tree when they’re ready. Lift the fruit and give it a twist rather than pulling it straight down from the branch; fruit that is ready should separate from the branch without much of a fight (though some varieties will be more strongly attached to the branches than others). Apples located on the outer branches will ripen earlier than apples located on the interior branches of the tree. By the same token, fruit that is growing on the sunny south- or west-facing sides of the tree are usually ready before those on the north- or east-facing sides. The color of the fruit’s skin and flesh can also be a good indication of an apple’s ripeness, but color shouldn’t be your only consideration. In our climate, some varieties will ripen before we see the skin colors that we’re used to seeing on that same apple variety purchased from the market. The flesh of some apples will turn from greenish to white when they’re ready to be picked, but this can also vary a bit with specific varieties. Of course, the most effective test of a fruit’s readiness is to give it a taste. A ripe apple should be juicy, sweet, and crisp, but easy to bite into. An apple isn’t quite ready if it’s hard, overly bitter and difficult to bite into or chew. Softer apples that lack juiciness and crispness are past their prime; they should be used immediately rather than stored. Fruit that is picked at the beginning of an apple’s harvest season will store longer than fruit picked at the end of the season, so plan to store the apples that you pick early, and use the late apples as soon as you’re able.